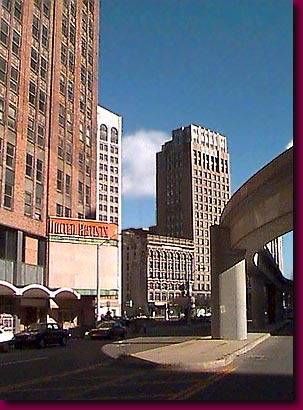 The long abandoned United Artists Theater is shown at the left in this view toward Grand Circus Park from Bagley Ave. The Adams Theater is in the lower building in the center background. The elevated People Mover track is seen on the right. The United Artists Theater was one of the many grand movie houses on and around Grand Circus Park.